Earlier this month I had a birthday and one thing that people know I will always appreciate for my birthday is tea. Because my mother knows me very well, she got me a pack of jasmine tea because I love jasmine. I don’t tend to drink a lot of flavored teas, with the notable exception of traditional flavors — so Earl Grey, the occasional masala chai, and floral-scented green and oolong teas. And rolled jasmine green tea is a particular favorite. Adagio Teas is probably the way I first got really into loose-leaf tea. I do remember visiting Teavana when one opened in a nearby shopping mall, but instead of buying there, I went home and opened up our newfangled internet machine to search “The ‘Web” for a way to find even more high-quality teas. I stumbled upon Adagio and first learned the joys of loose leaf tea. 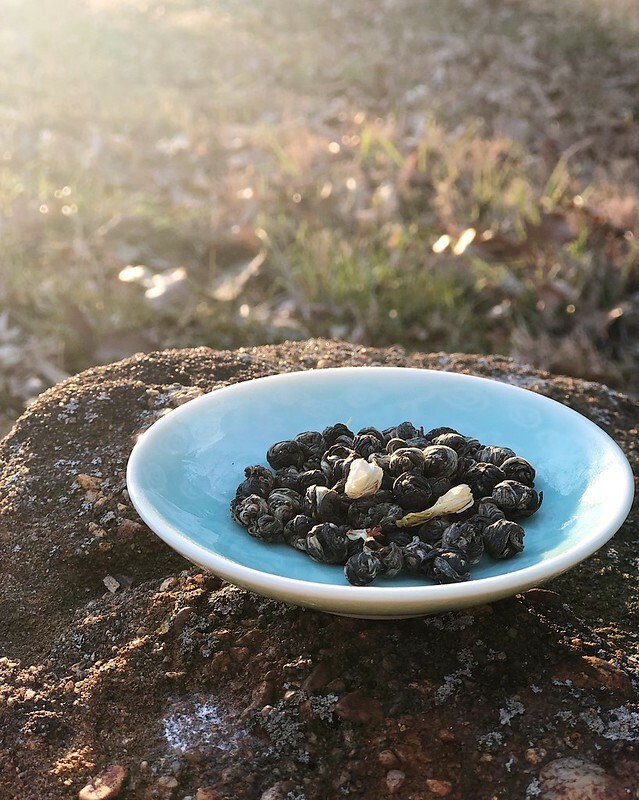 These Jasmine Phoenix-Dragon Pearls might have even been in my first order because I found the name romantic and lovely, and even as a teenager preferred deep floral scents to the typical light scents favored by my peers. But since then, I’ve moved beyond the one-stop shopping experience of Adagio Teas, so they don’t often feature in my rotation when I decide what to review. So because it seems appropriate for early spring, I thought I’d add some florals to my tea reviews. You know, for spring. The Adagio Teas Jasmine Phoenix (also called Dragon) Pearls are described as hand-rolled young tea leaves and buds, scented with jasmine. They are delicate and pretty to look at, with some variation in the color of the leaf, as well as a few white jasmine buds sprinkled in to enhance the look of the dry tea. When they steep, you can watch them unfurl into small leaves. The jasmine scent, particularly of the first infusion, is heady, and I find that it does best when it’s steeped for about a minute at first, and then as little as possible on subsequent infusions, until the strength of the tea settles down a bit. The brewed tea, if not allowed to oversteep, is luscious and almost sweet-tasting. It smells heavily of jasmine, but also of the vegetal notes of good-quality Chinese green tea. While the first steeping will always have the strongest flavoring for any scented tea, this tea maintains a respectable jasmine punch for several steepings, although as you go on, you’ll find the qualities of the green tea coming through more and more. While Chinese green teas are not my favorite, this is a lovely example of one. Adagio Teas is known in the tea community for being a bit overpriced for their quality, but there are a great place for someone who is new to tea to go and learn a bit about loose leaf teas before diving into sourcing teas more directly. Their website is visually pleasing and provides good information and reviews to help you choose a tea. And the fact that they offer small samples of almost all their teas is a fantastic bonus. NB: I was not paid or encouraged to write this review. While the tea in question was a gift, it was not a gift from the company. All thoughts are my own. Read more about my sponsorship and review policies here.